Home » Bands » Which Fitness Tracker Is Easiest To Put On? Which Fitness Tracker Is Easiest To Put On? The Jawbone Up took home the accolade of “hands down…the easiest wearable product to put on.” The band does not include any clasps or hooks into its design, making the product quite easy to throw on. Coming in second place was the Misfit Shine. The Shine is a standalone tracker that can be clipped on or worn on the wrist with a band (shown above). The device mimics the experience of putting on a watch, which made the process somewhat familiar to the users. The Fuelband scored poorly by comparison to the Up and Shine, mainly due to its rigid design and requirement to snap on. The snapping clasp would often pinch users skin, and in the worst case scenario for a device worn on the body, one test user even cut themselves open trying to snap on the bracelet. 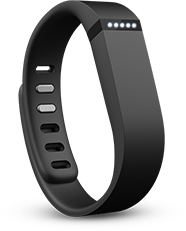 Scoring equally as poorly as the Nike Fuelband, the Fitbit Flex was found to be cumbersome and unreliable. The elastic rubber band felt cheap according to users, and caused multiple fumbles in getting the device on. Worst of all, the clasp often fell off. This has led to ebay sellers creating products to hack this band to ensure it doesn’t fall off. We will be updating as Jen continues to post on The Wearables Smackdown. You can read the full post on Jen’s Tumblr here.